Why do animal species vary so much in the shape of pupils in their eyes? Now the paper is long and complicated, with lots of simulations and math, but the upshot is pretty simple: animals tend to have vertical pupils if they are nocturnal “ambush” predators and aren’t too tall, while animals that have horizontal pupils tend to be prey that need to detect predators approaching them and also to scan the surrounding terrain to find a good escape route. These conclusions come from surveying 214 terrestrial species and gathering information about their pupal shape, when they were active, and their mode of foraging. This was combined with optical and mathematical analysis to determine the optimal shape to see under different conditions. (A) Different pupil shapes. From top to bottom: vertical-slit pupil of the domestic cat, vertically elongated (subcircular) pupil of the lynx, circular pupil of man, and horizontal pupil of the domestic sheep. (B) Pupil shape as a function of foraging mode and diel activity. The axes are pupil shape [vertically elongated, subcircular (but elongated vertically), circular, or horizontally elongated] and foraging mode (herbivorous prey, active predator, or ambush predator). Each dot represents a species. Colors represent diel activity: yellow, red, and blue for diurnal, polyphasic, and nocturnal, respectively. The dots in each bin have been randomly offset to avoid overlap. As the statistical analysis below show (and the graph above, in which the green dots are absent in vertical ambush predators) there’s also a relationship between pupil shape and activity period. That’s also shown in the following statistical analysis. The P values, which show the strength of the relationship (the lower the P‘s, the stronger the relationship between pupal shape and activity period or “activity”),imply that foraging mode is more important a determinant of shape than is activity period. In fact, there’s no relationship at all between circular shape and activity period. (C) Results of statistical tests on the relationship between foraging, activity, and pupil shape. Multinomial logistic regression tests were conducted with foraging mode, activity time, and pupil shape as factors and genus as a covariate. Relative-risk ratios were computed for having a circular, subcircular, or vertical-slit pupil relative to having a horizontal pupil as a function of foraging mode or diel activity. Activity time proceeded from diurnal to polyphasic to nocturnal. Foraging mode proceeded from herbivorous prey to active predator to ambush predator. When the relative-risk ratio is greater than 1, the directional change in the independent variable (foraging or activity) was associated with a greater probability of having the specified pupil shape than a horizontal pupil. The bulk of the paper is taken up with a complicated analysis of why different foraging modes should select (evolutionarily) for pupils of different shape. I’ll summarize the results very briefly; readers who seek further analysis should consult the original paper. Vertical slit pupils. It turns out that having a vertical slit in low light gives ambush predators an advantage in calculating the distance to a prey item. (Remember, these predators must accurately gauge the distance to a prey item before they strike.) The calculations suggest that a vertical slit is better at maximizing the blur of objects that aren’t in focus. That is, it helps the predator gauge the distance to a prey by seeing which aspects of the landscape are blurred and which are not. The vertical pupil also aids in stereopsis: the comparison of images from different eyes that is also used to judge distance to prey. In general, then, distance-judging, which is vital if an ambush predator is to eat, is maximized in low light by having a vertical slit. For such a predator, those that can best judge distance to prey are those that get more noms, and thus leave more offspring. And that, O Best Beloved, is why your small, ambush-predator cat has eyes with vertically slit pupils. Most terrestrial lateral-eyed animals are prey, so their adaptive strategy is to detect predators approaching along the ground and to flee quickly to avoid capture. The visual requirements for this strategy are striking. On the one hand, these animals must see panoramically to detect predators that could approach from various directions. On the other hand, they must see sufficiently clearly in the forward direction to guide rapid locomotion over potentially rough terrain. In both cases, the regions of greatest importance are centered on or near the ground. Conclusion: The authors have made a good hypothesis that seems to explain well the diversity of pupil shapes among animals based on both their foraging mode and time of activity. They recognize this problem and try to overcome it by giving instances in which animals have diverged from the pupil shape of their ancestors in the predicted direction based on changes in lifestyle. The ancestral canid, for instance, is thought to have been an ambush predator active at several times of day, and having subcircular pupils. The authors note that vertical slit and truly circular pupils evolved independently twice each within the canids, and in the direction expected from their activity periods and hunting patterns. This does show that “phylogenetic inertia” can be overcome, and that the data points are to some extent independent. But we don’t know how independent, for showing some independent evolution doesn’t tell us how often phylogenetic inertia has rendered other points non-independent. As far as I can see, the authors have recognized the problem of non-independence and dealt with it the best way they can, but haven’t fully overcome the problem. What they need is an analysis that uses only those data points known to represent independent cases of evolution (Allen Orr and I did this in our work on speciation in Drosophila). I’m not sure it’s possible in this dataset, but until it’s done, the statistical strength of their data remains in question. I think the authors are probably right in their conclusions, and I really like the paper, but I’d also like to see a statistical analysis that is based on “phylogenetically corrected” data. Banks, M.S. et al. 2015. Why do animal eyes have pupils of different shapes? Science Advances, Aug. 7, 2015, online. This entry was written by whyevolutionistrue and posted on August 10, 2015 at 11:30 am and filed under animal behavior, evolution. Bookmark the permalink. Follow any comments here with the RSS feed for this post. Both comments and trackbacks are currently closed. Very cool topic. Thanks, as always, for the breakdown. I also really like that you include constructive criticism of the papers that you highlight here. You bring up points that many of us laypeople wouldn’t necessarily consider. Ditto. My favorite type of post, by far! Thank you x2! Sadly, not too many people read these (or maybe they do, but they don’t comment). Don’t be discouraged. I’m sure a lot of people are like me, interested in and read the post, but have nothing constructive to add, so don’t comment. After reading the review here, I feel I learned more than I would elsewhere. To test this, I read coverage of this at WaPo and SlashGear and neither article had as much depth as this one. I’ve gotta admit in all the decades I’ve been around domestic cats and seen big cats, either in photos, on tv or at zoos, I never noticed that unlike small cats, the big cats have round pupils, more in common with our eyes than their feline cousins. And it makes perfect sense that there must be a particular reason for that as well as for the differences in the eyes of other vertebrates. And all explainable by evolutionary science rather than “well, that’s just how god made them” nonsense. Yes that’s me on a lot of Jerry’s posts. Everyone discusses politics and religion (and toilet paper hanging), but once you start talking about the best leather for cowboy boots, photo lens selection in nature photography, or the evolution of goats, I’m probably just going to lurk. I do enjoy the science articles. When you read about this sort of thing in the popular press it is generally simplified and sensationalized. And you don’t get an insightful critique from an expert. That is indeed the case for me. And I see a string of similar cases below. Sadly, the quality of the posts seems to almost be a deterrent from making a non-contributing comment. Like commenting directly in a science journal. I wish you had a “number of views” counter to provide a direct measure of each posts visibility. I also share the info with my daughter, and she loves it! I have also wondered about the # of views. I expect it is commendably high. I’ll just chime in and say that I’m more likely to read this kind of post than any other, but if your numbers indicate fewer people reading, this might be part of the reason: I’m much less likely to comment on these types of posts, so I’m much less likely to actually visit your website. I can read the text of the article from my RSS reader, but that doesn’t count as a page view in your stats. On the subject of phylogenetic inertia…what about arthropods? Might there be some way to extrapolate the principles to compound eyes? I’ll try to comment on more of them – your science posts keep me coming back! It is hard to make a comment outside one’s area of knowledge or expertese, unless it be to pose a particular technical question. I have only internet at work these days (i prefer to be able to read without distraction at home) so sometimes have little time to absorb these posts & consider what I might ask if I came back a day later… if you see what I mean! EXPERTISE! How did I do that?! Yet, I have no problem looking the fool when it comes to politics. I’m really good at that. Sadly I read many of these articles but never think to comment. maybe a simple thank you will let the autors know they are read and appreciated. The yellow mongoose also has very strange-looking eyes. The mongoose is a daytime animal if I remember correctly. I know they imported them to Hawaii long ago thinking they would take care of the rat problem but they didn’t because the rat is the nighttime. The mongoose also has extreme reflexes. One of the not so nice tricks they like to show in the far east is a mongoose in a cage with a python. Everyone thinks the mongoose is a goner but it kills the snake. Years ago I watched a documentary about research on venomous snakes in which while caring for the snakes being studied a guinea pig that was fed to one of the snakes killed the snake instead. The researchers were surprised. They then fed the same guinea pig to another of the snakes. Again, the guinea pig instead killed the snake. The researchers then retired the guinea pig to a well deserved life of mascot luxury. Score two for the guinea pig! Of course, snakes have to eat too. Now the g.p. can tell its grandkids about how he twice was nearly sacrificed to the evil snake demons but managed to turn the tables on them. 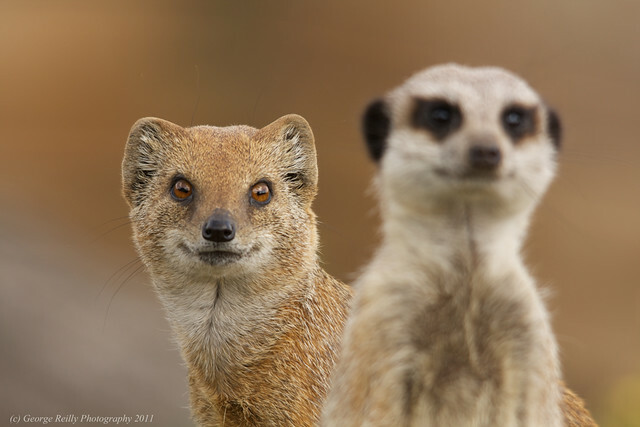 So why do yellow mongooses have horizontal pupils while meerkats have those cute round eyes? The two species are closely related and even share the same environment. Not qualified to answer but the mongoose are closely related to cats if that helps. The meerkats live in underground tunnels and their predators are primarily eagles. Very interesting bit of science. I wonder if this also explains why my cat (and I believe cats in general) are so cautious about new environments; their eyes aren’t adapted to do quick ‘safety’ scans of the surroundings. Cats are one of the groups analysed in the paper, because pupil shape varies from round to vertical-slit, and they also vary greatly in body size and amount of nocturnal activity, while (usefully) keeping other aspects of foraging behaviour relatively constant. OTOH, this means that sunglasses on a cat are entirely unnecessary. Too bad for you kittehs, the coolness of your eye musculature means you lose out on the coolness of wearing shades. I’m surprised to see those papers publicly available. In my country, those papers are part of an online library that can only be accessed by students, university teachers or paid members. There are efforts to make science papers available to the general public, but – as bureaucracy dictates – progress is slow. That’s still a big problem in the States, too. Yes, access to the scientific literature in the US is not as free as it ought to be, given that we all paid for its creation, but there is real progress in the right direction. A very interesting study, and thank you for the excellent post Jerry. I’m looking forward to digging into this one in a little more detail when I have the time. I am also looking forward to reading this post with the kids. They will love it! The general topic is right in their wheel-house, and they will get more exposure to critical thinking and the methods of science, especially from your comments on the paper. Like some of the other commenters, I don’t generally comment on these posts because I don’t have the background to add anything of substance. But I enjoy them a lot, especially since I wouldn’t get to see this kind of thing otherwise. I also really appreciate your willingness to summarize and comment on these papers. That helps me understand what’s going on and what the limitations might be. It’s a fair amount of effort on your part, but ends up being really cool for me. This was a subject that I asked my Biology-major daughter about and she came up blank….it doesn’t seem to be addressed in the standard biology curriculum. Interesting that the only bird with vertical pupil shapes is the black skimmer, which ambushes it’s prey (fish) by flying low over the water skimming it’s lower beak. This seems to suggest that it is viewing its predatory landscape in the same way that a small mammal would. You beat me to it about the skimmers. Skimmers must be an example of divergence from the ancestral form due to their feeding behavior. Is it proven that vertical slits gives a meaningful optical advantage for depth perception? Blur and Stereo-viewing are both optical technicalities that should be measured before such statement can be made. I would not be surprised if the optical advantage of is insignificant. In low light the pupils open so are not in a slit-configuration. Only in high-light would there be such advantage, if any. If the animal needs to hunt both during day and night, then it is important to be able to change the iris opening over a larger range. As the previous commenter noted, the split configuration in cats seems to allow for an order of magnitude larger size range than the circular pupil in humans. That is probably a more plausible explanation. But that explanation does not account for horizontal vs vertical slit configurations and their correlation with different animal foraging behaviors. It also does not account for the trend in animals of similar foraging behavior to have vertical slit configuration pupils below a certain height, but round pupils above a certain height. Of course it is a virtual certainty that the order of magnitude larger size range that you cite, and that Jacques Hausser mentioned in comment 4 above, is part of the answer, but it seems as certain that it is not the complete answer. The premise needs to be proven than an iris with a slit has better optical properties than a round iris for depth perception and/or for wider angle of view. If there are none (which I postulate), then any correlation between foraging behavior or size is more likely to be an evolutionary coincidence. It could also be bias in the selection of species that are used in the correlation. I imagine this could be modeled either physically or mathematically. The proof of the pudding is in the tasting. I haven’t had opportunity yet to look at the actual study in detail, but from the OP describing the paper . . .
“This was combined with optical and mathematical analysis to determine the optimal shape to see under different conditions. “That said, the advantage of having a vertical slit, for complicated optical reasons, diminishes as the eye gets higher off the ground. Those statements by the OP suggest that optical modeling was a primary aspect of this study. They then made some predictions based on their optical analyses and collected some observational evidence that seems to support those predictions. Definitely not definitive, but not bad. The OPs conclusion rightly points out that their data set is not as large a sampling as the numbers suggest because of a relatively high level of relatedness, leaving more room for bias. I am not suggesting your hypothesis is implausible, just pointing out that the study seems to have included optical analysis and modeling in just the way you say needs to be done. I’ve always found this topic fascinating, though admittedly in a more aesthetic sense. As humans we’re so centered on our own perception that the concept of having a field of vision such as that of the horse, which has a FOV of nearly 360d, is almost alien. What we humans see is that which is “in front” of us. That which is behind is us unseen. That’s why some people do things *right under your nose* or *in front of your face* while other, naughty people, do things *behind your back. * There’s a dichotomy of experience there that, were we outfitted like our horsey friends, wouldn’t even be a concept, or not so strong of one. I really have always wondered about this. The Prairies Rattlesnakes I encounter have vertical slits, while the Gopher Snakes have round pupils. The vertical pupils of nocturnal predators is well known, but I did not know about the use of other pupil shapes. This is cool. This is a very minor statistical quibble, but I think that description of p-values (“the lower the P‘s, the stronger the relationship between pupal shape and activity period or “activity”) isn’t precisely accurate. The p-value tells us how confident we should be that the stated degree of relationship actually exists — it doesn’t tell us about the strength of the relationship itself. (The statistical relationship between pupil shape and activity period could be very weak, and we could be very confident of that, or alternatively, the statistics could say that the relationship is strong, but that our confidence in that claim should be low.) If I am reading the data correctly, it is the relative-risk ratio that actually tells us the strength of the association between pupil type and activity. I disagree that its a minor point, though. …and, if it’s not the same, then I don’t understand the point…which would hardly be surprising…. I believe the point being made is indeed similar, although I think it is easier to understand in Munroe’s case. He cleverly presents 20 experiments, one of which shows a significant result at P < .05. In other words, with that p-value, a difference of the size the experiment found would be expected by chance 5% of the time, or 1 in 20. That's why cherry-picking statistical results is problematic, and why it is important to correct for multiple comparisons in these kind of situations. Thanks. Makes me feel marginally less unconfident…. Great point, though I do not consider this a “minor statistical quibble.” In fact, Jerry’s shorthand way of communicating what p-values are is an error, plain and simple. Unfortunately, that same error is committed by way too many researchers. Well, yes, I didn’t want to seem rude, but this mistake is really just wrong, although as you note it is common to see, from undergrads all the way up to working researchers. Interesting paper. I’m surprised that they didn’t include some monitors (Varanidae) in the study. Web images of the monitor seem to show a round pupil. Does this support the hypothesis? Interesting. I wonder what their model would say about Loricariid catfishes omega shaped pupil. Or the peacock mantis shrimp. Great post appears the authors need to do a little bit more homework to make this a robust study and otherwise really cool. Great post of the ‘interesting and I’ve always wondered why’ the variety of eyes. Before this, I have just thought it weird and interesting. Very nice. This has been a question I had for some time comparing the eyes of my family’s pets. Thank you for presenting and be assured that even if these posts don’t have many comments they get plenty of eyeballs. Great analysis, Jerry. I came away with the same thought – it would indeed be nice to see statistical analysis performed with “phylogenetically corrected” data. Function of pupil shape has long been debated. In 1919 Hartridge hypothesized that function of a vertical slit pupil (i.e. domestic cats) revolved around their tree-climbing/dwelling habits. Contours of trees and branches are mostly vertical, so if illumination of the image formed on the retina could be increased by decreasing the definition of the horizontal planes, it would be advantageous. Doesn’t quite hold up though considering other predators like alligators hunt along horizontal planes, yet have vertical slit pupils. Just so you know, I got that referenced as well. Oh, you must read the Just So Stories! That one I know. I actually visited there and looked for and found the fever-trees. They are one cool tree. They are actually geen and smooth. Snakes’ eyes have always interested me. Venomous snakes tend to have pupils like a cat and non-venomous snakes tend to have rounded pupils. 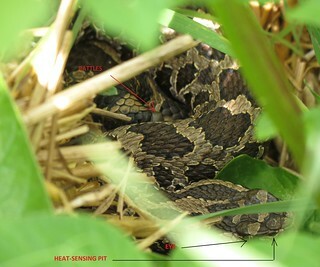 Both types of snakes are (obviously) low to the ground and both are predators. Why the difference? Is it because venomous snakes tend to strike more above their body height than non-venomous snakes? My friends who hunt rattlesnakes tell me that snake boots generally are from 16″ to 19″ in height, since the snakes usually strike at mid calf and unless the snake is on a ledge or log, he won’t go much higher. My corn can strike that high, so maybe strike height is not a factor. There’s been quite a lot of evolutionary change in pupil shape within the elapid snakes, with multiple origins (and several reversals) of the vertical ellipse from the round state, and at least a couple of species are polymorphic round/oval. Approximately all the cobras, seasnakes and large, active Australian elapids have round pupils, with vertical ones appearing (and disappearing)in various smaller nocturnal, sheltering or ambushing groups. It might be quite weakly selected, or picking up on different aspects of behaviour that we wouldn’t yet know much about. What’s especially interesting is that the variation within related species suggests that pupil shape is a relatively easy thing to change genetically. Ha! You can just see the eye if you click on it. She wasn’t posing very well. Vertical/horizontal pupils also allow the retention of good chromatic vision when contracted. Allowing each part of the lens (which tend to have different colour refractive indices from the edge of the lens to the centre) to focus the light. If contracted circularly the image would have significant colour aberration. There’s also an hypothesis that the weird pupil shapes in cephlapods allow colour vision even though they only have a single photoreceptor type by taking advantage of the degree of chromatic aberration. This would account for the paradox of apparently monochrome vision with a wildly colourful mating displays etc. That is really interesting, thank you! Very nice! Clever bit of work. A real eye opener, despite all the remaining concern (phylogenetic independence; real mechanism). I am not sure that this is correct. If I remember correctly, and to a first approximation, the field of view is independent of the aperture. After all, the human FOV does not increase as our pupils expand from 2 mm in bright light to 7-8 mm in poor light. What does vary (inversely) with aperture is depth of focus. Thus a cat would have greater depth of focus horizontally, and less vertically, but only in daylight. You are right: The field of view is not dependent on the aperture, so there is no apparent optical advantage for a goat’s slit eyes. Also, I question how much the difference between horizontal and vertical daylight depth-of-focus would aid a cat in its depth perception. The lack of rigour in the optical analysis makes the entire premise of the article very questionable. I question how much the difference between horizontal and vertical daylight depth-of-focus would aid a cat in its depth perception. Now, consider that the cat’s eye’s aperture is predictably asymmetrical and in constant motion, and it’s easy to see how the brain can integrate that information to provide enhanced spatial resolution. …and, come to think of it…you know how a cat’s pupils get really wide just before the cat pounces? That’s going to simultaneously brighten the image and narrow the depth of field…. Agreed that the lack of independence is a severe problem if the analysis doesn’t account for it. The CIs and p-values will be flawed. In effect, assuming independence makes the sample size look bigger than it really is, and hence the CIs narrower than they should be. Plus the calculations will in effect be assuming that the data are a random sample of species, whatever that might mean. They probably need some sort of hierarchical model, like a split-plot design or similar. However, in the chosen species the signal looks pretty strong, so it seems unlikely that they are just over-interpreting noise. Dennett is right – eyes are certainly a “good trick”. ms. trivia here, but I loved the opening that “here’s a picture . . . from National Public Radio.” Our descendants will read this and wonder how to watch a picture on the radio . . . ??? Actually, our descendants will likely be astonished to learn that there was once a content delivery medium that was restricted to nothing but audio. I suspect that, by then, “radio” will mostly be a technical term used to refer to a portion of the electromagnetic spectrum and only historical footnotes will mention today’s (yesterday’s) meaning. “Video killed the radio star” will be largely incomprehensible, with people wondering how a flat moving picture could cause the death of a pulsar.